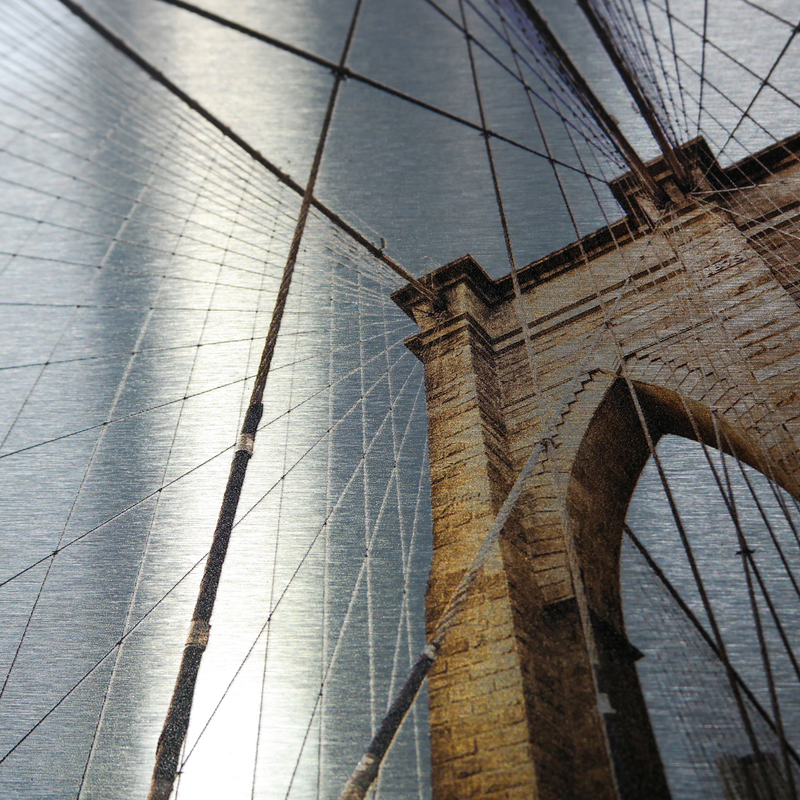 A brilliant alternative to traditional printing, the brushed aluminum finish of Dibond® brings an incredibly unique metallic texture to your art with unsurpassed durability. 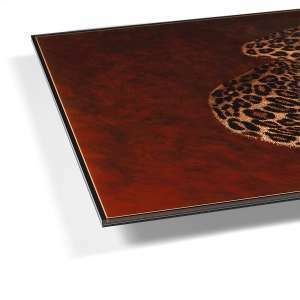 “Art displayed on Dibond metal is stunning. 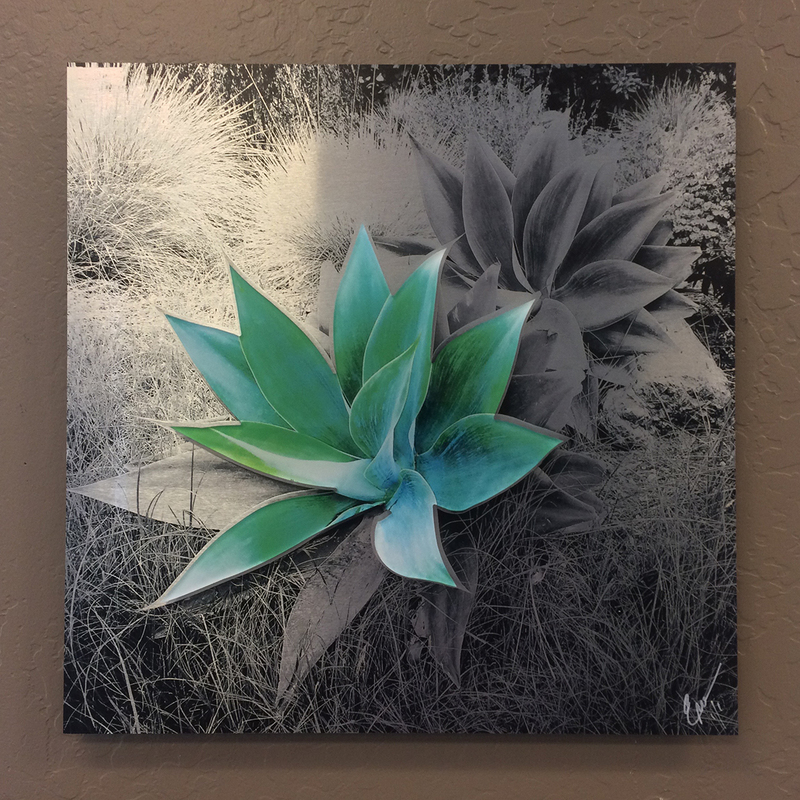 Dibond brushed aluminum prints are a great option for a clean, modern look with exceptional durability. 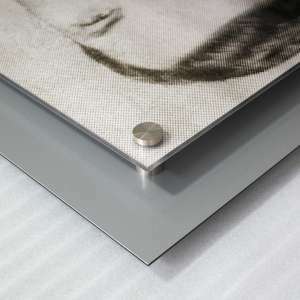 The sleek, brushed aluminum surface adds amazing depth to your fine art prints. 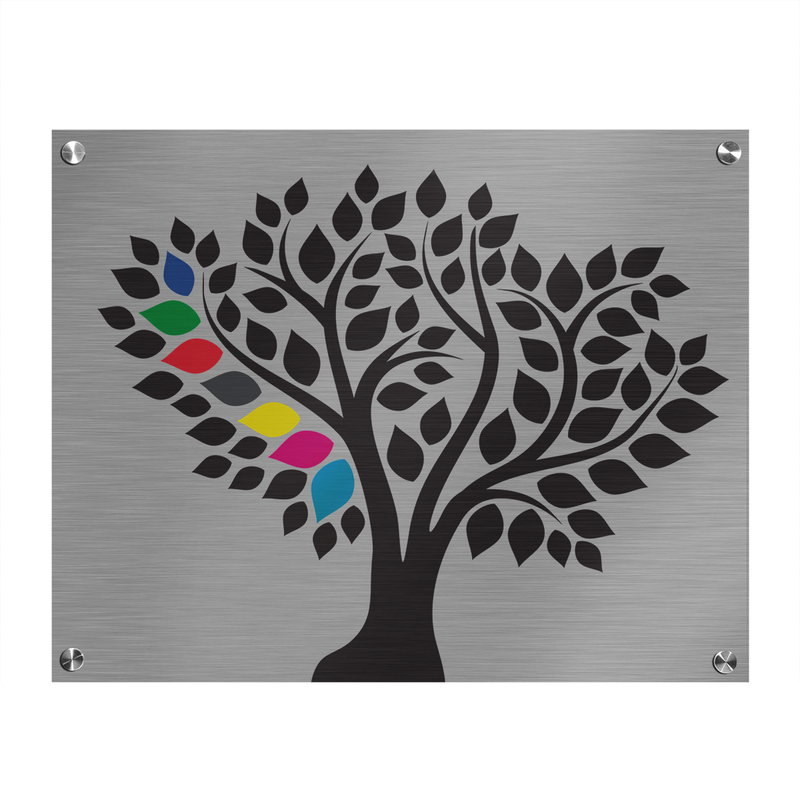 Your print on brushed aluminum will take on a life of its own, with extremely vivid colors with rich contrasts. 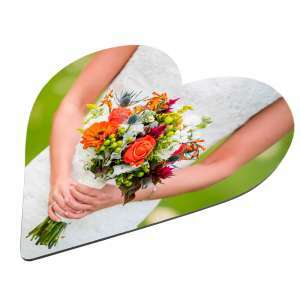 We print your photograph or artwork directly onto the smooth, brushed metal surface with great detail. 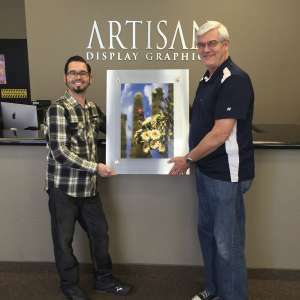 Artisan uses the latest in UV printing technology. 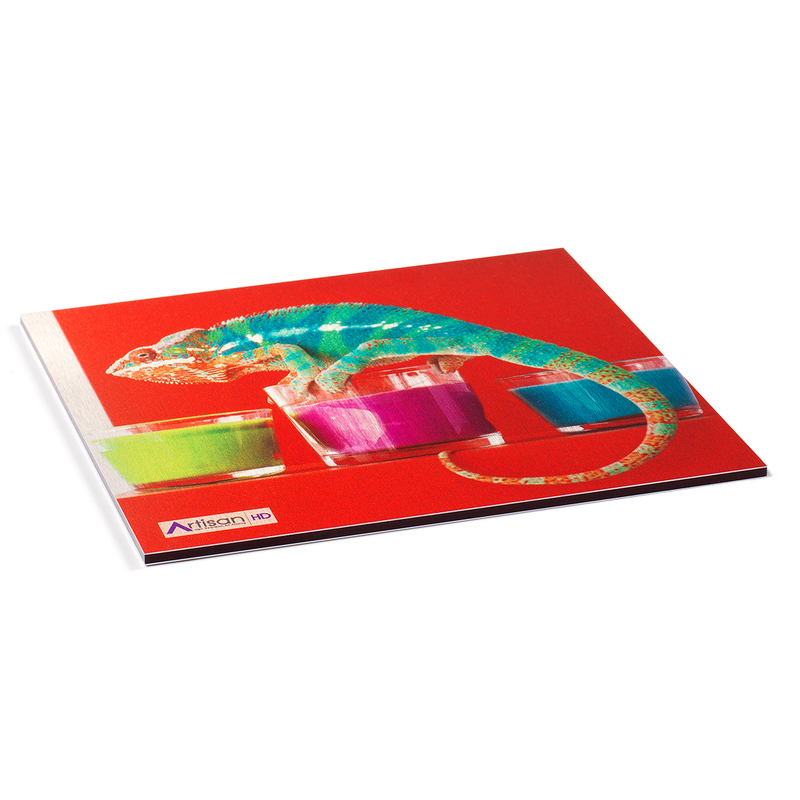 No paper or lamination is used in this process – our UV cured ink does all the work! 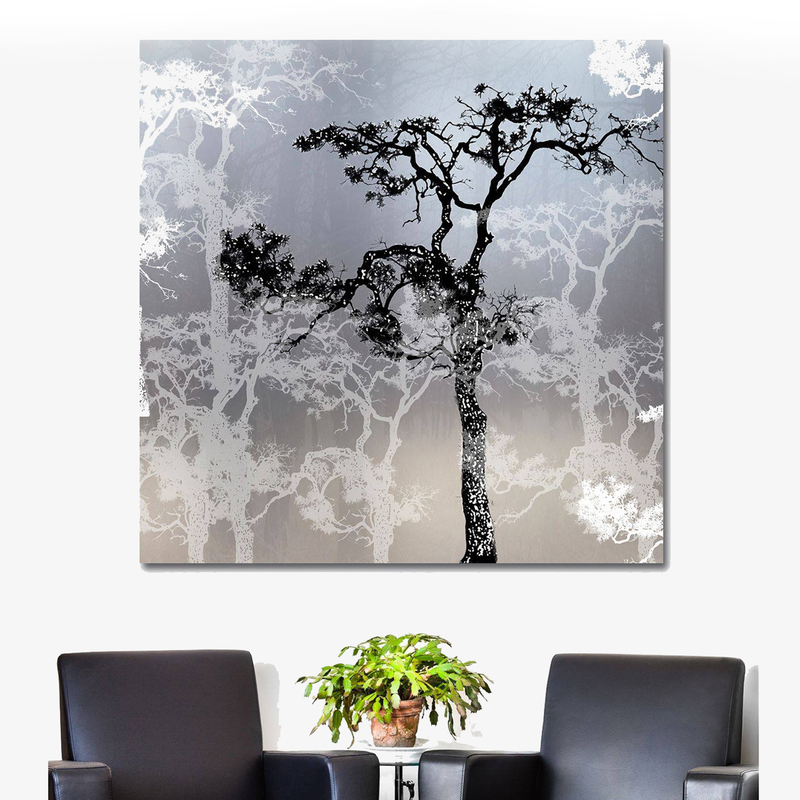 Any areas of your image that are a true white will reveal the raw, brushed aluminum metal surface. This presentation is particularly striking for images containing metallic surfaces – it’s almost 3D! 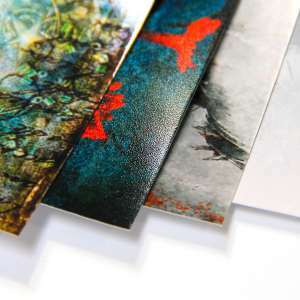 This metallic medium works well for numerous printing applications. 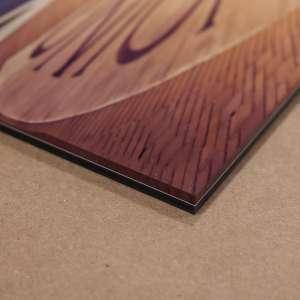 Dibond is 1/8″ thick, very stable, and extremely durable. It is lightweight but strong, and provides high resistance to weathering and corrosion. 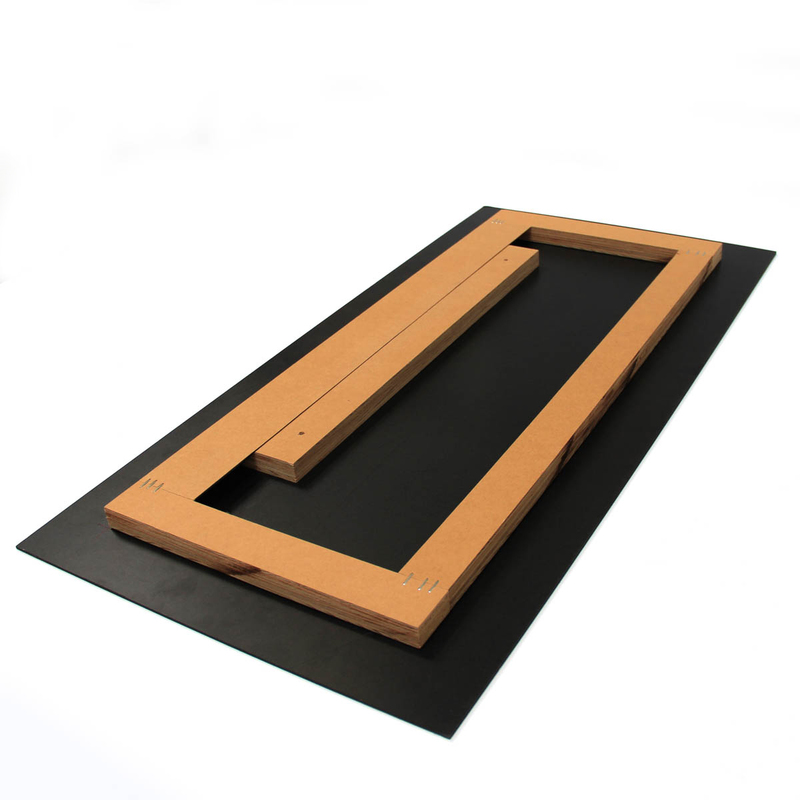 In fact, many modern buildings and architectural accents use this material. 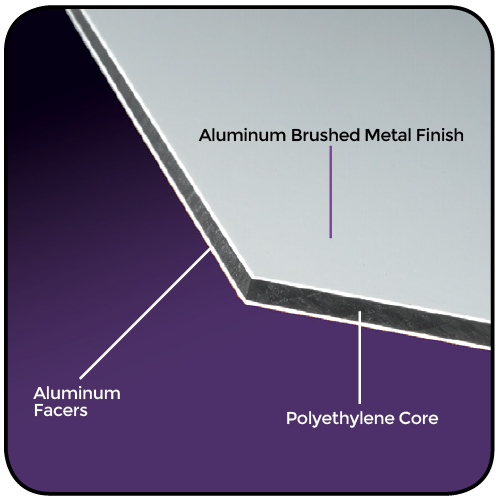 Dibond is a trade name for two thin sheets of aluminum (0.3mm) enclosing a polyethylene core. 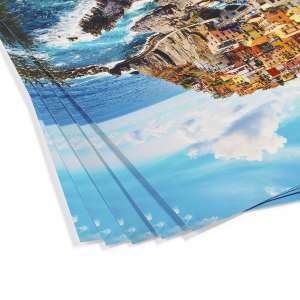 With its high stability and rigidity, this product makes an excellent base to print your work of art. 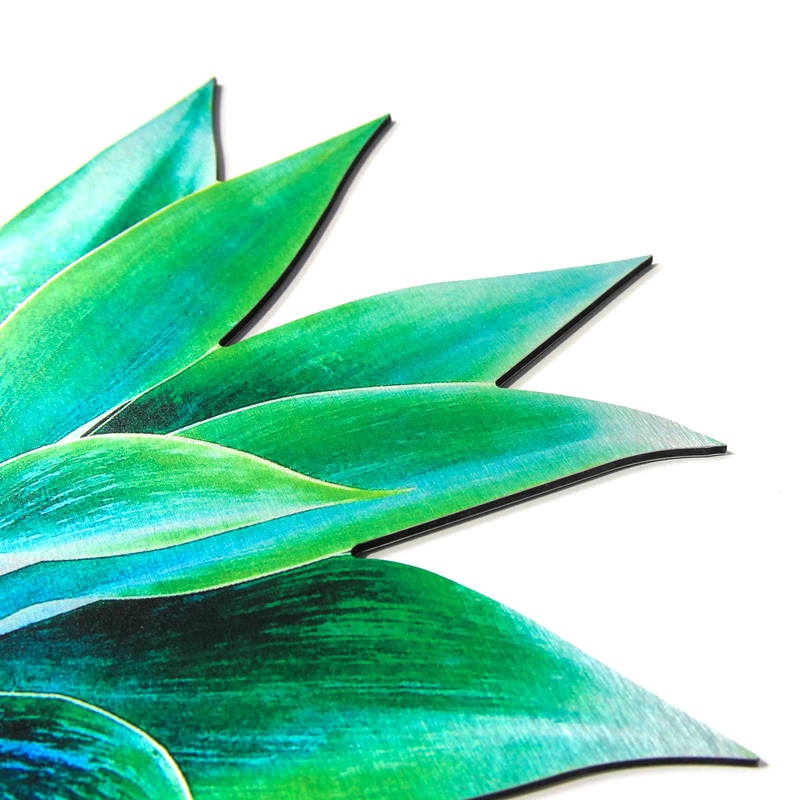 and the SHARP edges can be dangerous to small children and pets if placed low on your wall! Please be careful when opening your shipment, and with your installation and placement. 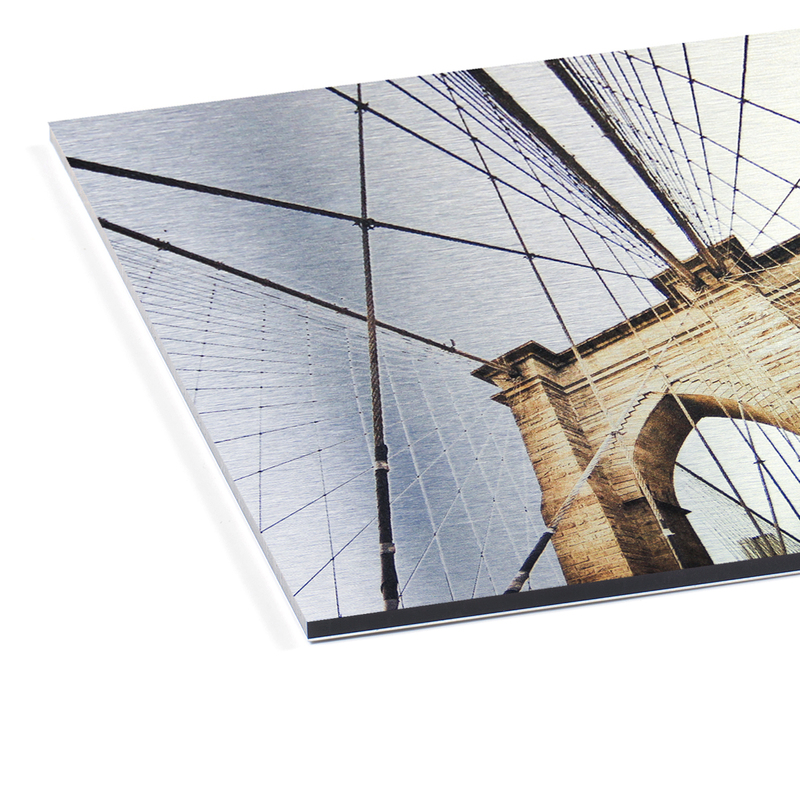 Have questions about our Dibond® metal prints? Thank you Sean! 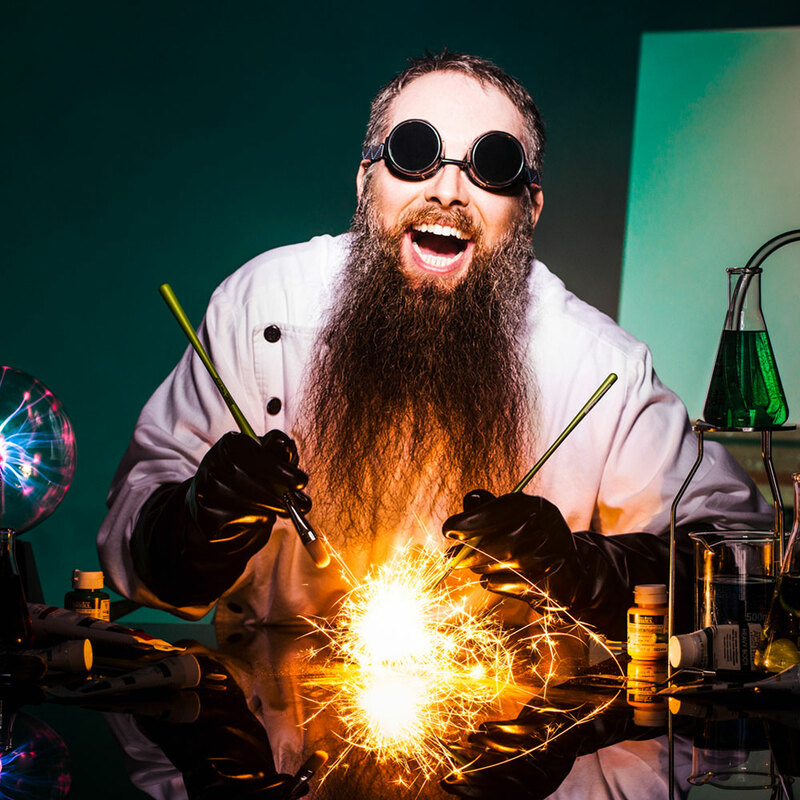 Making sure your creation is handled carefully from start to finish is our top priory. We are so glad that you appreciate the little extra efforts. I love the way the metal Dibond details the horse’s fine hair! Superior product and customer service is fantastic! 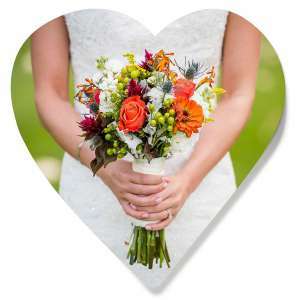 Thank you, Mike Goldner for handling any (minor) issues promptly and happily. It’s so important to deal with true professionals when creating a professional product. 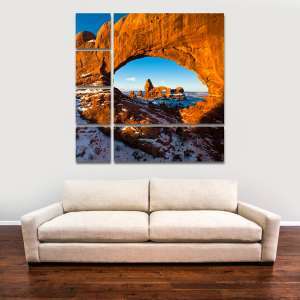 I am a photographer in AZ and I have several of my images in my home. Because I have high ceilings I was looking to exhibit something large between my book cases and ceiling–but didn’t want my living room to look like a gallery of my images. I contacted Mike from ArisanHD to brainstorm on some ideas. He introduced me to DiBond to give my Wild Tonto National Park Horses a different look and because of the natural light that comes in from a large slider, Mike assured me we would see the light reflect and play off of the piece. 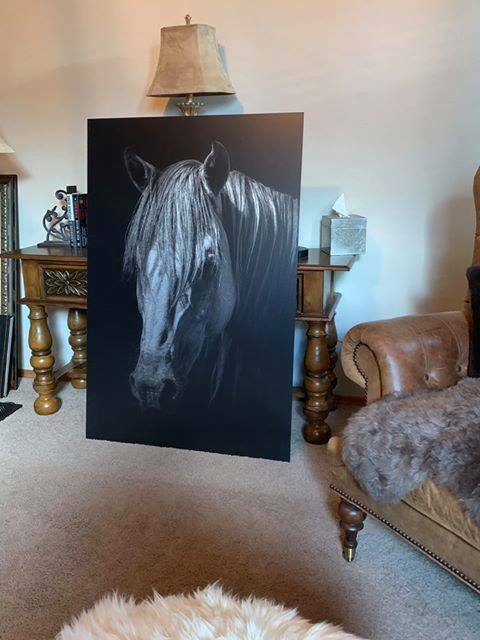 So in PhotoShop I altered the Wild Horses to sepia and added a rustic boarder and ordered a 48″ X 72″ DiBond print with Black anodized stand-offs, a wonderful way to hang the image so it is set off from the wall giving a wonderful look (Mike hand held me through this process as well). Mike’s response time, customer service, attention to my vision and hand holding were A+. Thank you Mike and ArtisanHD for catering to the one-offs. I will certainly be back! Thank you so much for your detailed review. We’re thrilled to hear that the recommended product (#Dibond) met and exceeded your expectations. 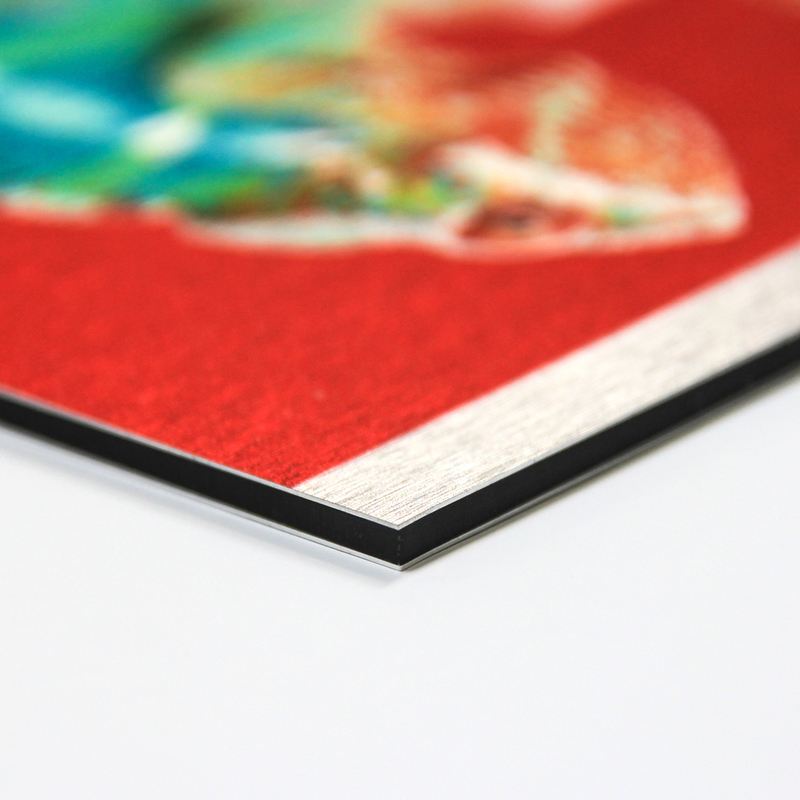 Giving individual photographers & artists access to Enterprise Level printing is a big part of our mission. We are so glad it worked for you! I’m an aerial photographer/videographer and have always wanted to get a print of my work to display at home. After seeing a print that a good friend of mine ordered from Artisan HD, I decided to order a dibond metallic print. I was somewhat nervous to invest money into a product I’ve never seen in person, but when the package arrived and was opened, I was stunned! What vibrant color. The metallic compliments the print perfectly, making the sunset seemingly shimmer, and the lights glow. I already have friends wanting prints and I will refer them to Artisan HD. Thank you! Artisan’s on-the-spot hospitality wowed me the moment I walked in the door. 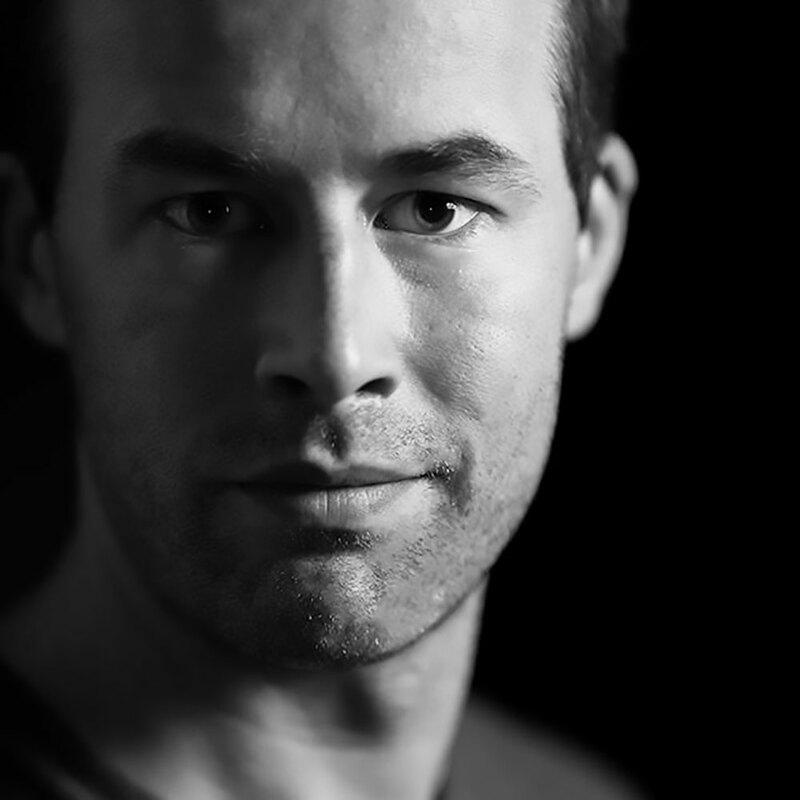 “Thank you” to photographer Bob Grebe for referring me. Gretchen King at the front desk assisted me with open arms the minute I walked in. She didn’t know me from Adam but she dropped everything to assist me; She immediately got the ball rolling on my small-format single print. I’m an independent fine artist who was looking for a high-end, high-quality, all-inclusive, one-stop print shop who prides themselves on paying as much attention to detail as I do. I believe the difference between good and great is detail and ArtisanHD excels at detail! Finding a print shop that pays close attention to detail was high on my list, so too, was finding one that happily accommodates independent artists who need low-volume and/or single prints done. Shops that boast a roster of clients as impressive as Artisan’s often act snobbish toward so called insignificant small-format low-volume artists like me. Not Artisan! 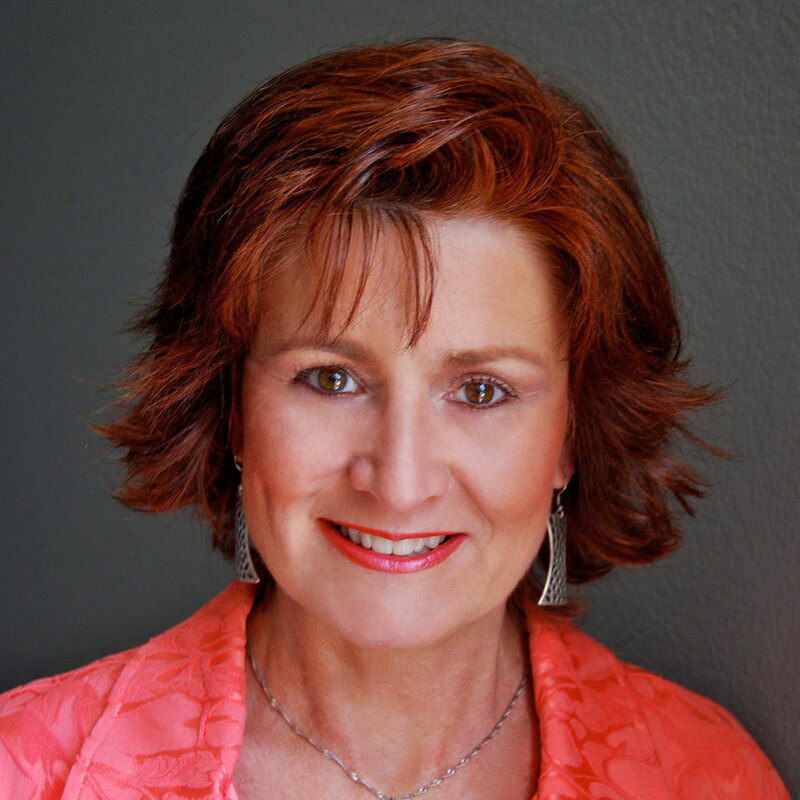 They treated me with the same respect they give their high-profile, high-volume clients. Artisan supports the average Joe. They’re an equal opportunity production and print shop. They made this artist feel welcome and valued and didn’t price gouge me on individual prints. Artisan’s rates for single prints are very reasonable and their frequent print sales at 20 to 30 percent off sweeten the pot. Like I said, my positive impression started at the front desk and transformed into a lasting positive impression! Account Manager Mike Goldner is great! 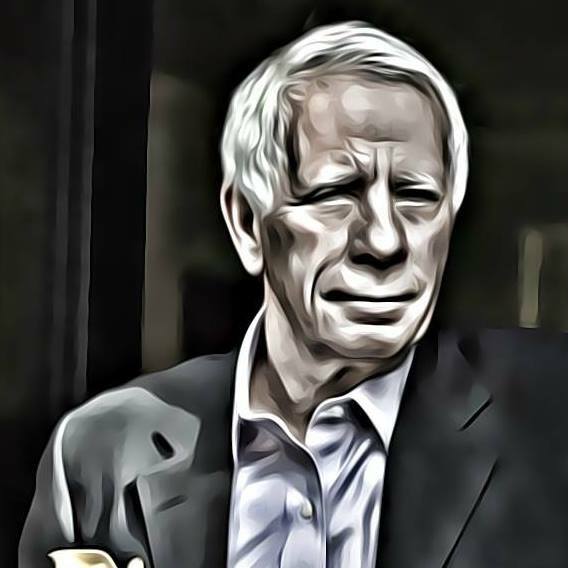 His knowledge and experience stands alone, but his genuine, easy going, approachable, down-to-earth manner won me over. His lightening-fast response to my request for a quote sealed the deal. 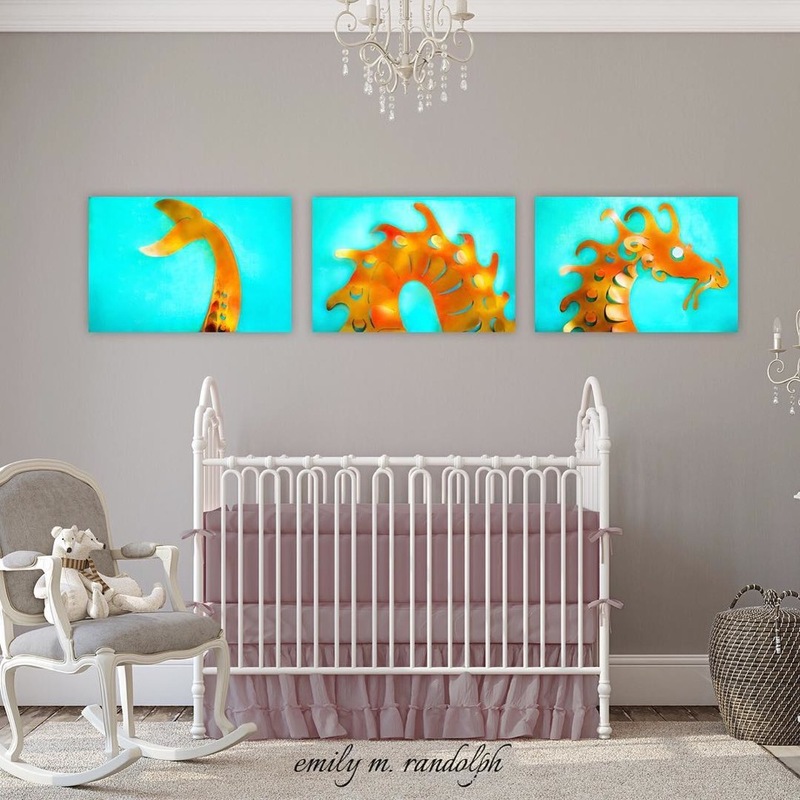 I immediately had a 30 x 40″ portrait printed as a Gicleé on canvas jewel-mounted and two Dibonds approx. 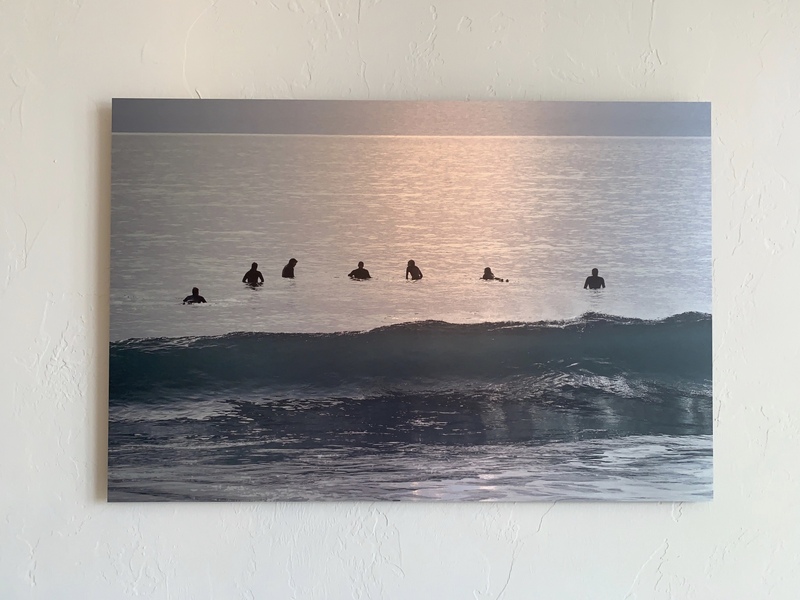 40 x 53″ printed a few weeks later. My clients and I were thrilled with the result! I value and trust Mike’s input and expertise. 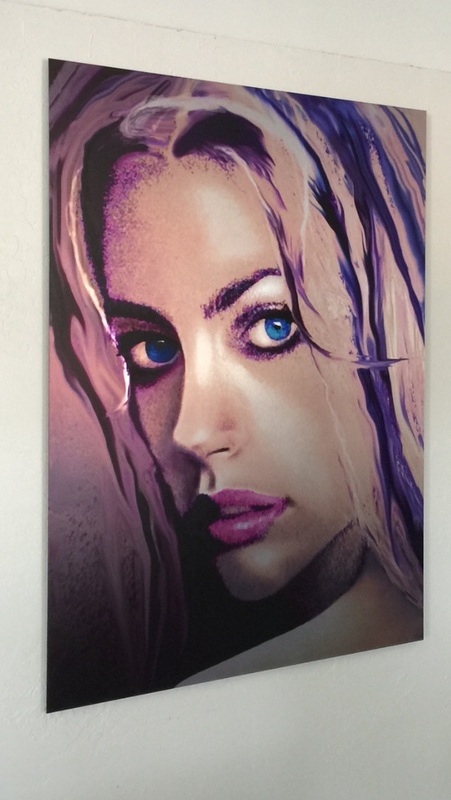 He recently suggested I print one of my contemporary pieces on Kodak Metallic Photo Paper. I look forward to it. Thank you ArtisanHD and your team for supporting the lil guy and making us feel welcome and worth your time. You’re exactly what this fine artist who’s new to fine-art sales was looking for! 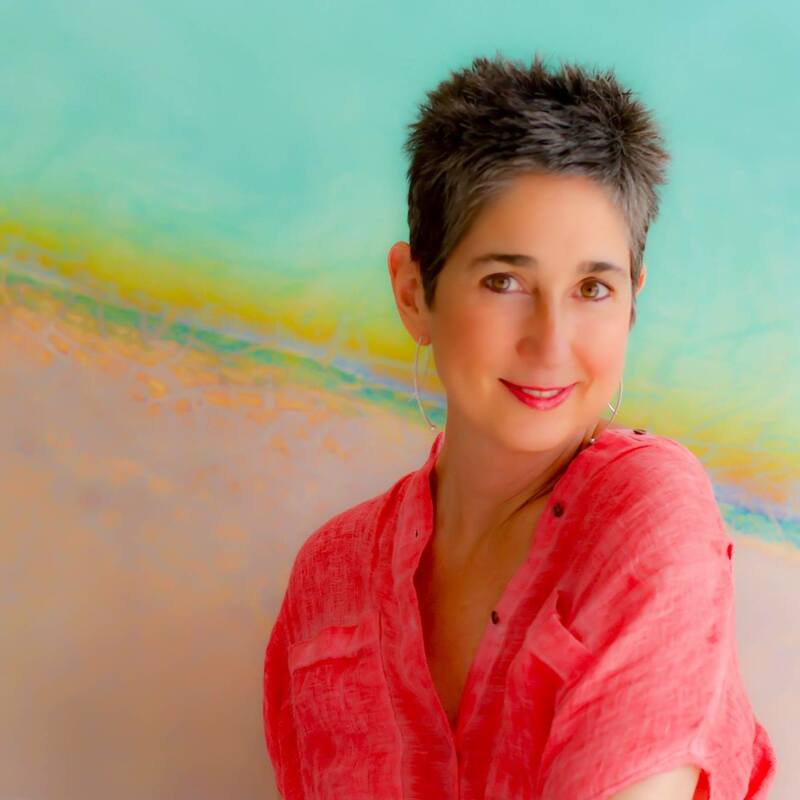 Thank you Gretchen K., Mike G., Wayne G. and Peter C. who all had a hand in prepping and printing my art and thrilling my clients! 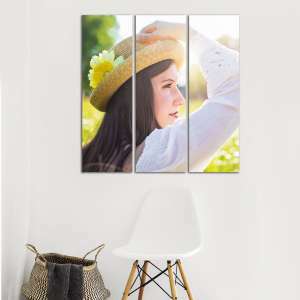 I have ordered multiple large scale prints on both canvas and Dibond and ArtisanHD always exceeds my expectations in both superb quality and excellent customer service. Even though I have moved from the area, I still choose ArtisanHD to do my prints. Beautiful work! This is the dragon from my youth from my parents’ stories and, at last, brought to life. 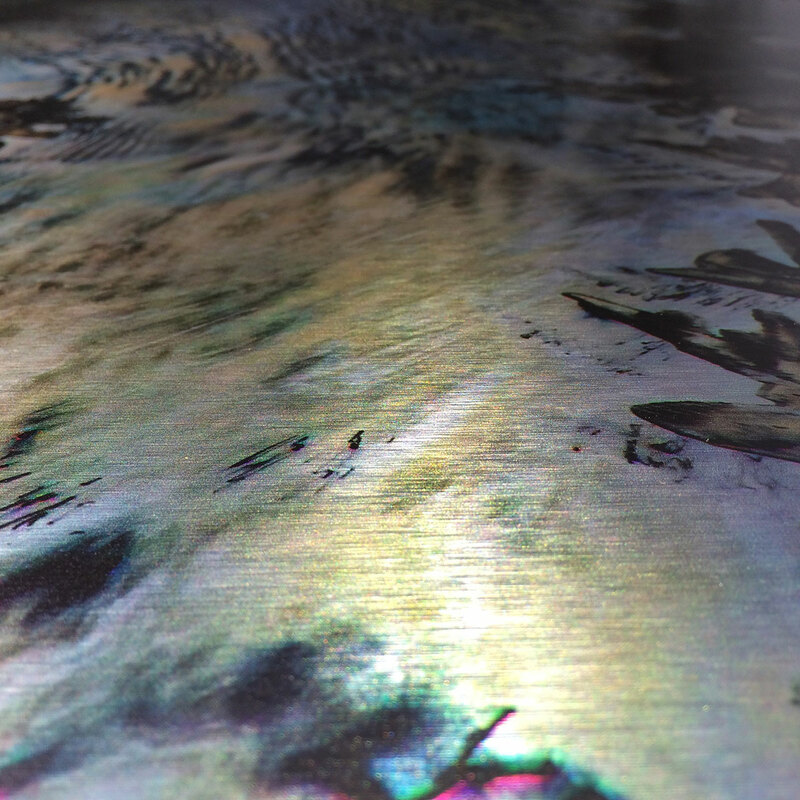 Art displayed on Dibond metal is stunning. Big shout out to my innovative partner ArtisanHD for their superior color, material and customer service. 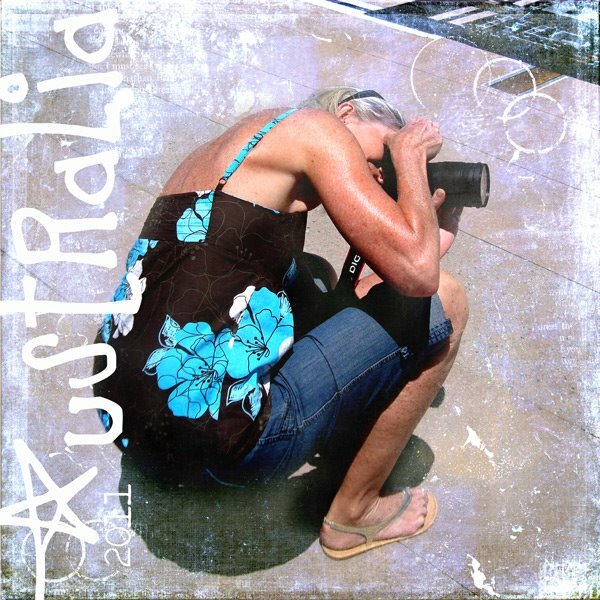 Working with Mike at Artisan Colour has offered me a big break through in my photographic art. I am a small fish in their big pond but they have always treated me as if I was a million dollar account. The time and cooperation they have afforded me has allowed me to create a new art form with big horizons for the future. They work hard to meet time driven deadlines I sometimes present and Mike is a great source of enthusiasm and encouragement for me. Thanks to him and everyone who is involved in my projects. i love Artisan HD prints mounted behind plexi, and prints on metal. I was even happy to wait patiently when they had a technical problem, resulting in delays. Flawless….. I achieved the Peter Lik type look from my last order and the metal prints are beautiful….. ready to order my 1.5m cinematic crop landscape…. it should be epic. I ordered one 30×46 Dibond. The quality of color, contrast, detail, etc. is perfect. Customer service is friendly and professional. Work was completed and delivered on time. To be more than happy with all aspects of service is a special treat! Quality was the best. Customer service was helpful and the videos on how to hang really helped. Fantastic service; very fast turnaround and absolutely beautiful finishing!